Background: Autoantibody specific for the aquaporin-4 astrocytic water channel is restricted to serum and CSF of patients with neuromyelitis optica (NMO) and related CNS inflammatory demyelinating disorders (relapsing optic neuritis and longitudinally extensive transverse myelitis). NMO-typical lesions are distinct from MS-typical lesions. Aquaporin-4 is lost selectively at vasculocentric sites of edema/inflammation coinciding with focal deposits of immunoglobulins (Ig) G, M, and terminal complement products, with and without myelin loss. Evidence for antigen-specific autoantibody pathogenicity is lacking. Methods: We used confocal microscopy and flow cytometry to evaluate the selectivity and immunopathological consequences of Ig binding to surface epitopes of living target cells expressing aquaporin-4 fused at its cytoplasmic N-terminus with GFP. We tested serum, IgG-enriched and IgG-depleted serum fractions, and CSF from patients with NMO, neurologic control patients, and healthy subjects. We also analyzed aquaporin-4 immunoreactivity in myelinated adult mouse optic nerves and spinal cord, and plasma cell Ig isotypes in archived brain tissue from an NMO patient. 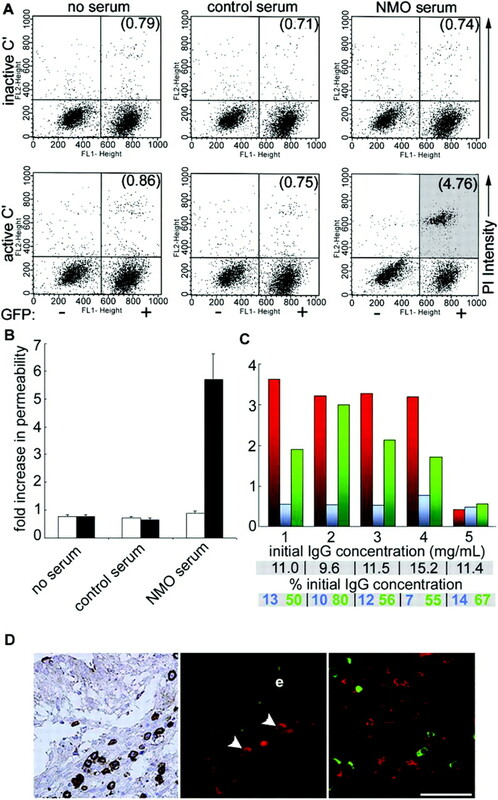 Results: Serum IgG from patients with NMO binds to the extracellular domain of aquaporin-4; it is predominantly IgG1, and it initiates two potentially competing outcomes, aquaporin-4 endocytosis/degradation and complement activation. 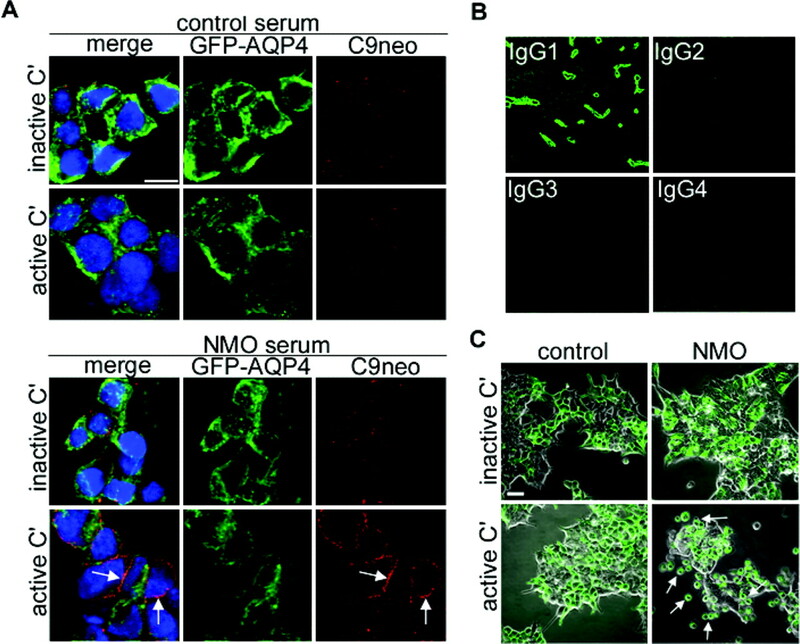 Serum and CSF lack aquaporin-4-specific IgM, and plasma cells in CNS lesions of NMO contain only IgG. Paranodal astrocytic endfeet highly express aquaporin-4. Conclusions: NMO patients’ serum IgG has a selective pathologic effect on cell membranes expressing aquaporin-4. IgG targeting astrocytic processes around nodes of Ranvier could initiate demyelination. This report addresses three questions concerning the pathogenesis of NMO raised by the identification of AQP4 as a disease-specific antigen2: 1) What are the immunobiological outcomes of immunoglobulin interaction with AQP4 in target cell membranes? 2) What classes of AQP4-specific Igs have pathogenic potential? and 3) What accounts for loss of myelin (an oligodendrocyte product) if NMO is an autoimmune water channelopathy targeting astrocytes? Cell lines and transgenic constructs. Fluorochrome-conjugated goat IgGs were purchased from Molecular Probes (Alex-Fluor 546: human, mouse, or rabbit IgG specific; and Oregon Green: mouse IgG specific) or Invitrogen (Cy5; rabbit IgG specific). Conjugated monoclonal mouse IgGs (FITC: specific for human IgG subclasses; or Cy3: specific for glial fibrillary acidic protein and sodium channel) were from Sigma, and unconjugated IgGs were from BD Biosciences (Caspr1 and early endosome antigen-1 [EEA1]) and Dako, Denmark (human CD138). Goat IgGs monospecific for human IgG (TRITC conjugated) or human IgM (FITC conjugated) were from Southern Biotechnology. Rabbit IgG specific for AQP4 residues 249-323 was from Sigma. Rabbit IgG specific for human C9neo was a gift from Dr. Paul Morgan, Cardiff, UK. Deidentified patients’ sera were obtained from the Neuroimmunology Laboratory, Department of Laboratory Medicine and Pathology, Mayo Clinic, Rochester, Minn.
All final preparations of live cells, and sections of mouse tissue and autopsied human lymph node and brain tissues, were mounted in ProLong Gold DAPI antifade medium (Molecular Probes). Fluorescent images were captured from a Zeiss LSM510 confocal microscope. Immunoperoxidase-stained sections were counterstained with hematoxylin and were photographed from an Olympus DP-BSW microscope and DP70 digital camera system. Live cells were exposed sequentially to 20% human serum or rabbit anti-AQP4 IgG diluted 1:1000, a secondary antibody (1:500), and chilled 95% ethanol/5% acetic acid (15 minutes). Cells fixed in 10% formalin were permeabilized, blocked, and incubated in primary and secondary antibody probes. Tissues dissected from perfused mice were postfixed overnight in 4% paraformaldehyde, held 24 hours in 30% sucrose, frozen in OCT medium, sectioned (8 μm), air-dried, and incubated sequentially in 10% normal goat serum containing 0.1% triton X-100 (30 minutes), primary antibody (18 hours), and secondary antibody (1 hour; room temperature). Autopsied human lymph node and brain tissues, fixed in 10% formalin and embedded in paraffin, were deparaffinized, sectioned (5 μm), washed in bidistilled water, and steam heated. Sections were incubated with 10% normal goat serum (1 hour) and then overnight at 4°C with primary antibody (anti-CD138 at 1:50; anti-IgG at 1:750; anti-IgM at 1:200). Complement was inactivated in the serum of patients and control subjects by holding 30 minutes at 56°C. Time-lapse photomicrographs of living cells were captured at 15-minute intervals for 24 hours. Media containing human serum were replaced at 16 hours with fresh media, with or without cycloheximide (0.25 μg/mL). Test sera were added to the culture media for either 16 hours at 37°C or for 1 hour at 4°C. Cells were washed, exposed for 30 minutes to Alexa-Fluor 546-labeled anti-human IgG (1:500), washed again, fixed in chilled 95% ethanol/5% acetic acid, rinsed in PBS, and stained with Hoescht (1 μg/mL). GFP-AQP4-HEK293 cells were incubated for 2 hours on ice with 20% heat-inactivated control or NMO patients’ serum. Cells were washed with chilled DMEM media and exposed to 20% fresh (or heat inactivated) normal human serum (as the complement source) for 45 minutes at 37°C. After rinsing and fixing (10% formalin, 4 minutes), cells were incubated sequentially, at room temperature, in 0.1% 3-[(3-cholamidopropyl) dimethylammonio]-1-propanesulfonate (1 minute), 10% normal goat serum and rabbit anti-human C9neo antibody (30 minutes), washed and incubated in labeled anti-rabbit IgG. To evaluate complement’s effects on membrane integrity, test pools of human serum were added to the cells at 4°C (for 1 hour). After subsequent incubation for 90 minutes at 37°C (95% air/5% CO2) in fresh or heat-inactivated Low-Tox-H rabbit complement (Cedarlane Lab; 20% final concentration), the monolayer was examined and photographed by transmitted bright-field imaging. To quantitate complement-mediated membranolytic activity by flow cytometric analysis after sequential exposure to serum (30 minutes at room temperature) and complement (37°C for 30 minutes), the cells were lifted with trypsin, washed, suspended in chilled buffer (10 mM Hepes/NaOH, pH 7.4; 140 mM NaCl; 2.5 mM CaCl2) containing 0.5 μg of propidium iodide (BD Biosciences), and held in the dark for 15 minutes before analysis. Increase in membrane permeability was determined by comparing the percentage of propidium iodide–permeable GFP-positive cells with that of propidium iodide–permeable GFP-negative cells. In the absence of antigen-specific activation of complement, the increase in membrane permeability was less than 1.25-fold (125%). IgG was depleted from serum pools using protein G-agarose beads (2 hours at 4°C). IgG-depleted serum was used at a concentration of 20% in the complement assay. IgG eluted from washed protein G beads in 0.1 M acetic acid was neutralized, dialyzed against PBS, and concentrated using Centricon YM-3 filter devices (Millipore). IgG concentrations were determined by rate nephelometry. GFP-AQP4-HEK293 cells were seeded onto optical-quality glass-bottom plates (MatTek) and exposed to 20% control or NMO patients’ serum (see video E-1 on the Neurology® Web site at www.neurology.org). Time-lapse photomicrographs of the living cells were captured at 15-minute intervals for 6 hours, using a Zeiss LSM510 microscope with the stage held at 37°C in 95% air/5% CO2. Z series imaging was performed for each time point and converted into video. NMO-IgG initiates endolysosomal degradation of AQP4. A prerequisite for IgG to effect organ-specific pathogenicity is its capacity to bind to specific epitopes accessible on the surface of living target cells. When we exposed transfected target cells expressing surface AQP4 to a pool of NMO patients’ sera (at 4°C to restrict membrane fluidity), IgG bound to the plasma membrane in a linear pattern that colocalized with GFP-AQP4 (figure 1A). Serum IgG from control patients did not bind detectably to the cell surface, and a control rabbit IgG specific for AQP4 cytoplasmic epitopes did not bind unless the plasma membrane was permeabilized. NMO patients’ serum IgG did not bind to vector-transfected control HEK293 cells (data not shown). Thus, NMO patients’ IgG binds specifically to the extracellular domain of AQP4. (A) IgG in control serum does not bind. Rabbit IgG specific for cytoplasmic AQP4 epitopes (C-terminal residues 249-323) binds only to permeabilized cells. 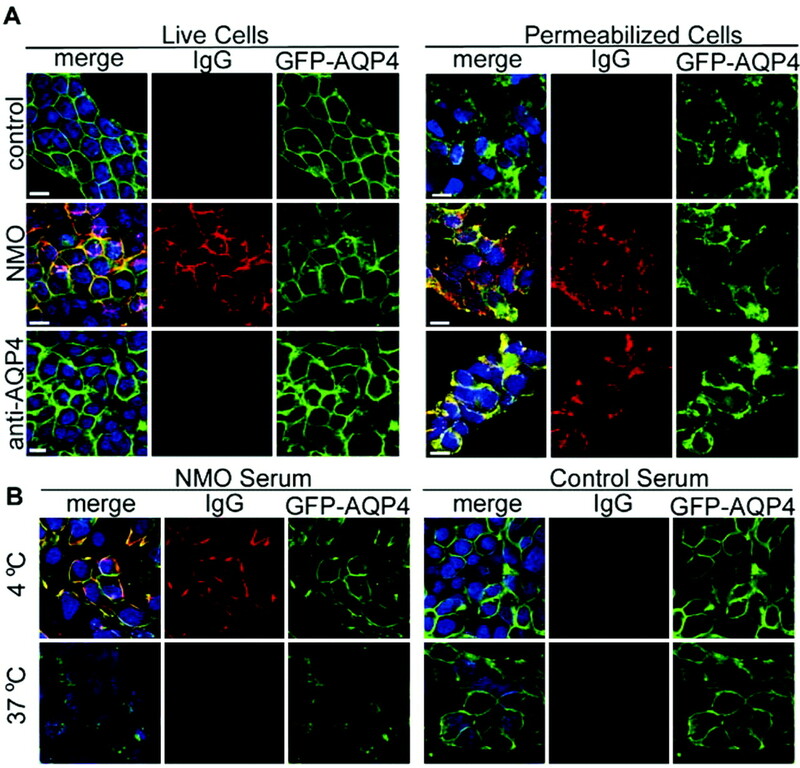 IgG in NMO patients’ serum colocalizes with surface AQP4 on both living cells (i.e., extracellular epitopes) and in permeabilized cells (both extracellular and cytoplasmic epitopes). DNA is stained with DAPI (blue). (B) At 4°C, NMO patients’ serum IgG colocalizes with surface AQP4 in a linear pattern. Neither IgG nor AQP4 is detectable on the cell surface after overnight incubation at 37°C. Control serum IgG does not bind at either temperature. Scale bars represent 10 μm. To evaluate the influence of this IgG on plasma membrane AQP4, we recorded the distribution of GFP-AQP4 after exposure to patients’ serum at 37°C. Control human serum had no effect on GFP-AQP4, but NMO patients’ sera containing AQP4-specific IgG resulted in rapid disappearance of GFP-AQP4 from the plasma membrane (figure 1B and video E-1). The phenomenon’s temperature dependence (figure 1B) is consistent with modulation of surface antigens through intermolecular cross-linking by bivalent IgG.18 Serial confocal images of living cells held at 37°C for 16 hours in serum lacking AQP4-IgG were indistinguishable from images of untreated cells with respect to GFP-AQP4 fluorescence intensity and localization (figure 2A). Cells exposed to NMO patients’ serum underwent a striking redistribution within 5 minutes. The homotetrameric structure of AQP4, with multiple repeated epitopes in the extracellular domain, and the proximity of individual AQP4 homotetramers, provides an optimal target for rapid surface clearance from the plasma membrane by antigen-specific IgG. Plasma membrane fading was accompanied by green fluorescent vesicle accumulation in subplasmalemmal cytoplasm. After 20 minutes, GFP-AQP4 aggregated in ring-like structures. At 5 hours, when plasma membrane fluorescence was no longer detectable, these had coalesced into large, cytoplasmic aggregates. Removal of the patients’ serum at 16 hours resulted in rapid reappearance of GFP-AQP4 in subplasmalemmal vesicles, presumably en route from the endoplasmic reticulum (figure 2B). By 4 hours, GFP-AQP4 was visible in the plasma membrane, and by 12 hours it had attained normal surface density. When cycloheximide was added at the time of withdrawing patients’ serum, no GFP-AQP4 was seen on the plasma membrane during 12 hours of observation. This implies that the “reversal” of the autoantibody’s effect was dependent on new protein synthesis. (A) Time-lapse imaging of GFP-AQP4 in transfected HEK293 cells during 12 hours of exposure to serum of an NMO or control patient (at 37°C). Surface AQP4 is lost rapidly in NMO patient serum, but not in control serum. With loss of surface AQP4, small vesicular structures appear in the cytoplasm and rapidly coalesce. (B) Restoration of surface AQP4 after removal of NMO patient serum requires new protein synthesis. The abundant small vesicles observed in the absence of cycloheximide reflect newly synthesized AQP4 in transit to the plasma membrane for insertion. In the presence of cycloheximide, residual foci of cytoplasmic fluorescence gradually disappear, reflecting continued degradation. (C) Binding of IgG in NMO patients’ serum to surface AQP4 triggers endocytosis and targets AQP4 to the endolysosomal pathway. Early endosomal vesicles (identifiable by red EEA1 immunoreactivity) do not colocalize with AQP4 in untreated cells. Within 30 minutes of adding NMO patients’ serum, several EEA1 foci coincide with cytoplasmic vesicles containing AQP4 (yellow in the merged panel; white arrows in the enlarged panel). Scale bars represent 10 μm. We followed the fate of GFP-AQP4 cleared from the plasma membrane after exposure to NMO patients’ serum by probing with an antibody specific for an early endosome antigen. In the absence of serum, early endosomal vesicles (red) did not colocalize with GFP-AQP4 (figure 2C). However, after 30 minutes of exposure to NMO patients’ serum, early endosomal vesicles acquired green fluorescence (figure 2C). Early endosomal vesicles did not acquire green fluorescence when cells were exposed for 2 hours to control sera (data not shown). These results indicate that endocytosis, initiated by the cross-linking of AQP4 by IgG binding at the cell surface, targets AQP4 to the endolysosomal pathway for degradation. Activation of the classic complement cascade is another potentially pathogenic outcome of autoantibody binding to AQP4. 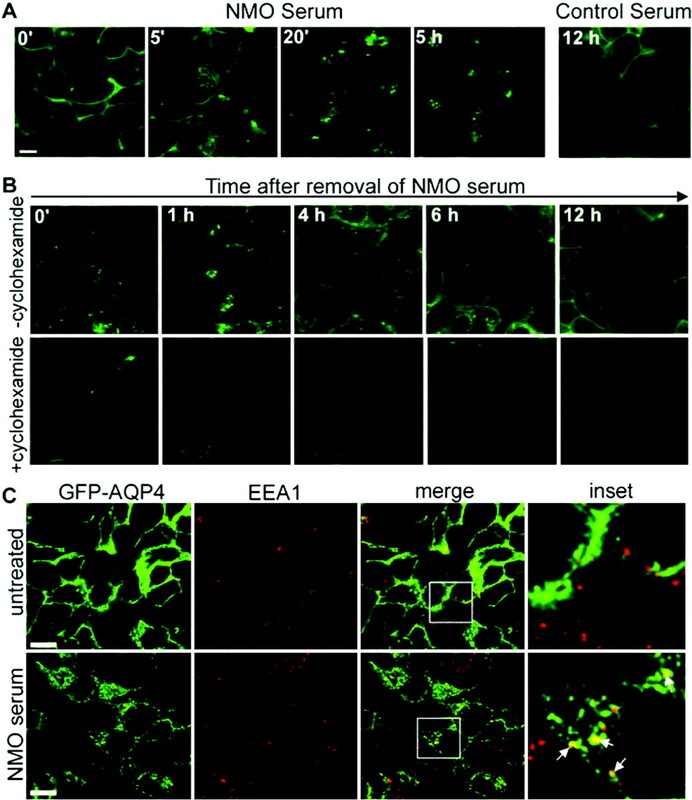 This mechanism would increase the permeability of microvascular endothelium, promote inflammatory cell infiltration, and possibly inflict focal damage to astrocytic endfeet in CNS regions enriched in AQP4. We first evaluated surface membranes of transfected cells by indirect immunofluorescence for deposition of the C9neo epitope created by the polymerization of multiple perforin-like C9 molecules in assembling the terminal membrane attack complex of complement.9,19,20 In the presence of NMO patients’ sera and active human complement, C9neo was clearly visualized in the plasma membrane of HEK293 cells expressing AQP4 (figure 3A, arrows), but not in the absence of disease-specific serum or in the presence of inactive human complement, or in control cells transfected with GFP vector (data not shown). These data indicate that NMO patients’ sera contain an AQP4-specific antibody capable of activating the complement cascade. Reagents specific for human IgG subclasses revealed that AQP4-specific serum IgG was, in all NMO-IgG–positive patients tested, exclusively IgG1, which is a major complement-activating IgG subclass in man (figure 3B). (A) Formalin-fixed AQP4-transfected HEK293 cells were exposed to control human serum or NMO patient serum in the presence of active or inactive complement (C′). Plasma membrane incorporation of the terminal C9neo component (arrows) requires NMO patient serum and active complement. (B) IgG subtypes detected using fluorescein-conjugated subtype-specific anti-human IgG probes (γ1, γ2, γ3, and γ4 heavy-chain specific, respectively) on mouse brain sections. Only IgG1 was detected (five of five individual NMO patients’ sera, and a serum pool representing 10 additional seropositive patients). Production of this major complement-activating subclass of human IgG reflects a proinflammatory helper T-cell immune response. Its vasculocentric binding pattern coincides with AQP4-rich sites.2 Specificities and optimal dilutions of the IgG subclass-specific reagents were confirmed using smears of human myeloma IgGs, which were kindly provided by Dr. Robert Kyle, Mayo Clinic. One patient’s serum contained IgG3 antinuclear antibody (not shown). Scale bars represent 10 μm. (C) Living cells exposed to control or NMO patient serum. In the presence of AQP4-specific IgG and active complement (1.5 hours at 37°C), cells expressing AQP4 (green) are selectively detached from the monolayer, indicated by arrows (transmitted bright-field image). Preliminary experiments indicated that membrane lysis conditions had to be rigorously controlled to evaluate functional evidence for antigen-specific complement activation by NMO-IgG on membranes of living cells expressing AQP4 in high density. The GFP-AQP4 transfected target cell line was a mixed population of GFP-positive (AQP4+) and GFP-negative (AQP4−) cells (figure 3C). In the presence of control human serum, phase microscopy revealed healthy AQP4+ and AQP4− cells in an adherent monolayer. When we preexposed the target cells to disease-specific patients’ serum (on ice for 2 hours) before adding complement for 90 minutes at 37°C (conditions used for the C9neo visualization), all green cells disintegrated rapidly. We therefore used a standardized commercial preparation of rabbit complement, in limited concentration, and we preexposed the cells to patient or control serum at 4°C for just 1 hour before adding fresh or heat-inactivated complement. In the presence of NMO patients’ serum, adherent cells that visibly expressed GFP were selectively lost. Provided that complement was active and present for more than 30 minutes, most AQP4+ cells were rounded and floating (figure 3C). Control human serum did not visibly affect either adherent population, regardless of complement activity. Thus, the cytolytic activity of NMO patients’ serum depended on both complement activity and AQP4 expression in target cells. Quantitation of target cell membrane lesioning by complement, using flow cytometric analysis (indicated by permeability to the red dye propidium iodide), necessitated further attenuation of complement activation. We therefore preexposed the cells to patients’ (or control) serum at room temperature for just 30 minutes (rather than 1 hour at 4°C), to allow some reduction of AQP4 antigen density by antigenic modulation, before adding complement. We then incubated with complement at 37°C for only 30 minutes before harvesting for analysis of green and red fluorescence intensities. Exposure to active or inactive complement had no effect on either AQP4+ or AQP4− cells in the presence of control patients’ serum (figure 4, A and B). NMO patients’ serum had no effect on membrane integrity when complement was inactivated, regardless of AQP4 expression in the target cells. However, with active complement there was an average 5.6-fold (560%) increase in the membrane permeability of AQP4+ cells compared with AQP4− cells (figure 4B). Thus, the cytotoxicity of NMO patients’ serum depended on surface expression of AQP4 and on the availability of active complement. (A) Comparison of increase in membrane permeability of HEK293 cells expressing AQP4 (in parentheses) is in reference to the population not expressing AQP4. Flow cytometric analysis: GFP, x-axis; propidium iodide intensity, y-axis. Membrane permeability is increased 4.76-fold (i.e., 476%) with an NMO patient’s serum and active complement (shaded quadrant), and less than onefold in a control patient’s serum or no human serum. (B) Quantitation of membrane cytotoxicity induced by NMO serum and active complement (30 minutes at 37°C). Results are the average of seven independent experiments, each using an individual serum pool from 10 to 15 different NMO patients or from approximately 350 control patients with miscellaneous disorders. (C) Complement-dependent, AQP4-specific cytotoxicity is inherent in IgG, not IgM. Five pools of patients’ serum were tested for functional evidence of AQP4-specific IgM. Four pools were positive for AQP4 IgG (by immunofluorescence1 and immunoprecipitation2), and one was negative. Each pool contained serum from four to five individual patients. Increase in membrane permeability was measured using either whole serum (red), IgG-depleted serum (blue), or purified IgG (green). (D) Plasma cells in a subventricular inflammatory lesion in the medulla of an autopsied NMO patient contained IgG but not IgM. (Left) Immunoperoxidase staining: Rarified, edematous tissue contains CD138-positive plasma cells (arrowheads); e is ependyma. (Middle) Dual immunofluorescence staining: The medullary lesion contains IgG+ plasma cells (TRITC; red); IgM+ plasma cells (FITC; green) were not found in any CNS lesion, but immune complex deposits below the ependyma are faintly IgM+. (Right) IgG+ (red) and IgM+ (green) plasma cells in control human lymph node tissue stain with equivalent intensity. Scale bar represents 50 μm. AQP4-specific autoantibodies are not IgM class. Vasculocentric deposits of IgG, IgM, and complement are a hallmark of histopathological lesions found in CNS tissue of NMO patients.9,14,15 Because pentameric IgM has five Fc effector domains, it activates the complement cascade more efficiently than does IgG (a single Fc domain). Therefore, we analyzed sera and CSF of NMO patients for AQP4-specific IgM. By indirect immunofluorescence evaluation on sections of AQP4-rich mouse tissues,1 none of 31 individual NMO patients’ sera or of 28 NMO patients’ CSF specimens had detectable AQP4-specific IgM (data not shown). We used the flow cytometry assay to test for functional evidence of a complement-activating, AQP4-specific IgM in serum from patients who were either positive or negative for AQP4 antibody of IgG class in the course of clinical immunofluorescence evaluation.1 Only the AQP4 IgG-positive sera (pools 1–4) were cytotoxic for AQP4+ cells. This cytotoxic activity was lost when IgG was depleted (figure 4C). Recovery of AQP4-specific complement activation restored by IgG from the original positive serum pools was proportional to the percent total recovery of IgG from the protein G–agarose beads (figure 4C). To determine immunohistochemically the frequency of IgG and IgM production in inflammatory CNS lesions of NMO patients, we investigated accumulations of differentiated plasma cells15 using fluorochrome conjugated anti-human IgG and IgM class-specific reagents at limiting dilutions to avoid interference from background extracellular IgG and IgM.9 The medullary lesion of the illustrated patient (figure 4D, left) contains abundant CD138-positive plasma cells and is in a region normally rich in AQP4.15 Plasma cells in the medullary lesion stained brightly for cytoplasmic IgG, but cytoplasmic IgM was not detected in any plasma cell (figure 4D, middle). We confirmed the immunoglobulin class specificity of our detection antibody reagents on control sections of human lymph node tissue. Clusters of plasma cells exhibited bright, cytoplasmic IgG, and scattered plasma cells exhibited bright, cytoplasmic IgM (figure 4D, right); very few cells were dually labeled (not shown). In summary, these data suggest that the IgM deposited with IgG and complement products in AQP4-rich regions of NMO patients’ CNS tissues9,14,15 is not AQP4 specific. AQP4-enriched astrocytic processes surround nodes of Ranvier in spinal cord and optic nerve. Involvement of myelin in the pathology of NMO remains to be explained in the context of AQP4. Freeze-fracture studies in the early 1970s defined assemblies of particles as an ultrastructural characteristic of astrocytic endfeet surrounding axons at the nodes of Ranvier.21 These assemblies correspond to recently identified orthogonal arrays formed by AQP4 homotetramers in transfected cells.16 We analyzed the proximity of AQP4-specific immunoreactivity in astrocytic membranes to the nodes of Ranvier by examining sections of mouse spinal cord and optic nerve tissues by confocal fluorescence microscopy. We used immune rabbit IgG (affinity purified on AQP4 peptide) rather than NMO patients’ serum because the latter is a complex mixture of multiple autoantibodies8,22 and is not amenable to affinity purification, because it binds only to native AQP4 and not to denatured, membrane-extracted AQP4 or synthetic AQP4 polypeptides (V.A. Lennon and T.J. Kryzer, unpublished observations). 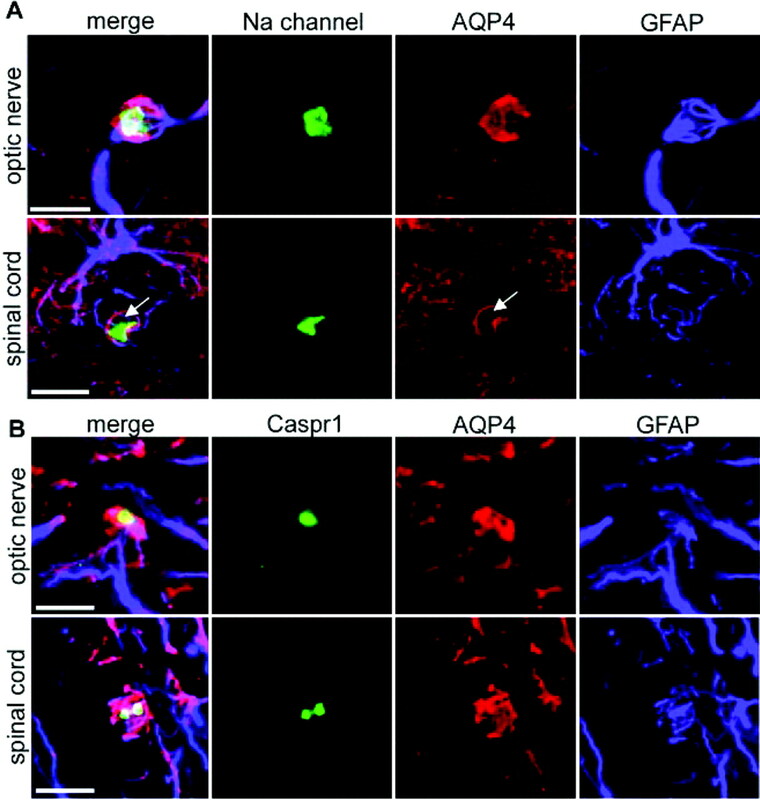 AQP4 was localized with respect to nodal regions by simultaneously immunostaining sodium channels,23 which are densely concentrated in the nodal axonal membrane (or Caspr1, an abundant paranodal protein24) and glial fibrillary acidic protein (GFAP), the cytoplasmic intermediate filament of astrocytic processes.25 In both the spinal cord and optic nerve, AQP4 immunoreactivity was intense near astrocytic elements and encircled periodic axonal segments expressing sodium channel immunoreactivity (figure 5A). The concentric paranodal AQP4 immunoreactivity was brighter than the background mesh pattern of astrocytic AQP4 characteristic of CNS white matter1 and was devoid of GFAP, which astrocytic foot processes lack.15 As shown in figure 5A, the extracellular space surrounding astrocytic processes is enlarged in the region of the axon segment bearing sodium channels.23 The juxtaposition of intense AQP4 and Caspr1 immunoreactivities (figure 5B) is consistent with extension of the astrocytic foot process beyond the node of Ranvier into the paranode. Immunofluorescence staining of mouse optic nerve and spinal cord for AQP4 (red), glial fibrillary acidic protein (GFAP, blue), and (A) sodium channels (green) or (B) Caspr1 (green). A ring of AQP4 immunoreactivity surrounds the node (arrow, A) and paranodal axon (B). Scale bars represent 10 μm. Several plausible mechanisms might initiate demyelination in NMO. Firstly, oligodendrocytes are more susceptible than astrocytes to lethal injury by noxious stimuli.30 Injury to the oligodendrocyte that produces and maintains myelin would be anticipated at paranodes where they directly contact AQP4-containing astrocytic foot processes. Alternatively, secondary demyelination might result from axonal injury attributable to alteration of the ionic microenvironment at the internode. Glutamate toxicity is a third potential mechanism for initiating demyelination. The astrocytic glutamate transporter, GLT1 (also known as EAAT2), which is critical for clearing glutamate from excitatory synapses, depends on AQP4 expression for its own expression.31 Thus, a regional increase in glutamate levels, resulting from the downregulation of astrocytic AQP4 by NMO-IgG, may kill oligodendrocytes that express calcium-permeable glutamate receptors in their processes.30,32 Therapeutic blockade of AMPA receptors was shown to ameliorate neurologic sequelae in animal models of MS.33,34 Clinical trials of glutamate receptor blockade are warranted to investigate its effectiveness as a therapeutic strategy for protecting myelin and axons in acute NMO. The authors thank Denice Bredlow, Aaron Maixner, and members of the Neuroimmunology Laboratory and the Mayo Flow Cytometry/Optical Morphology Core Facility for technical assistance, and Dr. John Henley for suggesting use of the EEA1 marker of endolysosomal targeting of IgG cross-linked AQP4. e-Pub ahead of print on October 10, 2007, at www.neurology.org. This work was supported by the Mayo Foundation and a grant from the Ralph Wilson Medical Research Foundation. Disclosure: In accordance with the Bayh–Dole Act of 1980 and Mayo Foundation policy, Drs. Lennon and Lucchinetti and Mr. Kryzer stand to receive royalties for intellectual property related to the AQP4 autoantigen. This intellectual property is licensed to a commercial entity for development of a simple antigen-specific assay to be made available worldwide for patient care. The test will not be exclusive to Mayo Clinic. To date, the authors have received a total of <$10,000 in royalties. Mayo Clinic offers the test as an indirect immunofluorescence assay to aid the diagnosis of neuromyelitis optica, but the authors do not benefit personally from the performance of the test. The other authors report no conflicts of interest. Presented by Dr. Vanda Lennon as a “Frontiers in Neuroscience” Lecture at the 58th Annual Meeting of the American Association of Neurologists, San Diego, CA, April 6, 2006. Received June 13, 2007. Accepted in final form September 4, 2007. Zuliani L, Lopez de Munain A, Ruiz Martinez J, Olascoaga J, Graus F, Saiz A. NMO-IgG antibodies in neuromyelitis optica: a report of 2 cases. Neurologia 2006;21:314–317. Takahashi T, Fujihara K, Nakashima I, et al. Establishment of a new sensitive assay for anti-human aquaporin-4 antibody in neuromyelitis optica. Tohoku J Exp Med 2006;210:307–313. Jarius S, Franciotta D, Bergamaschi R, et al. NMO-IgG in the diagnosis of neuromyelitis optica. Neurology 2007;68:1076–1077. Abbott NJ, Ronnback L, Hansson E. Astrocyte-endothelial interactions at the blood-brain barrier. Nat Rev Neurosci 2006;7:41–53. Amiry-Moghaddam M, Ottersen OP. The molecular basis of water transport in the brain. Nat Rev Neurosci 2003;4:991–1001. Keegan M, Pineda AA, McClelland RL, Darby CH, Rodriguez M, Weinshenker BG. Plasma exchange for severe attacks of CNS demyelination: predictors of response. Neurology 2002;58:143–146. Pittock SJ, Lennon VA, Krecke K, Wingerchuk DM, Lucchinetti CF, Weinshenker BG. Brain abnormalities in neuromyelitis optica. Arch Neurol 2006;63:390–396. Pittock SJ, Weinshenker BG, Lucchinetti CF, Wingerchuk DM, Corboy JR, Lennon VA. Neuromyelitis optica brain lesions localized at sites of high aquaporin 4 expression. Arch Neurol 2006;63:964–968. Misu T, Fujihara K, Nakamura M, et al. Loss of aquaporin-4 in active perivascular lesions in neuromyelitis optica: a case report. Tohoku J Exp Med 2006;209:269–275. Roemer SF, Parisi JE, Lennon VA, et al. Pattern-specific loss of aquaporin 4 immunoreactivity distinguishes neuromyelitis optica from multiple sclerosis. Brain 2007;130:1194–1205. Rash JE, Davidson KG, Yasamura T, Furman CS. Freeze-fracture and immunogold analysis of aquaporin-4 (AQP4) square arrays, with models of AQP4 lattice assembly. Neuroscience 2004;129:915–934. Raff MC, Miller RH, Noble M. A glial progenitor cell that develops in vitro into an astrocyte or an oligodendrocyte depending on culture medium. Nature 1983;303:390–396. de Petris S, Raff MC. Normal distribution, patching and capping of lymphocyte surface immunoglobulin studied by electron microscopy. Nat New Biol 1973;241:257–259. Meri S, Morgan BP, Davies A, et al. Human protectin (CD59), an 18,000-20,000 MW complement lysis restricting factor, inhibits C5b-8 catalysed insertion of C9 into lipid bilayers. Immunology 1990;71:1–9. Farkas I, Baranyi L, Ishikawa Y, et al. CD59 blocks not only the insertion of C9 into MAC but inhibits ion channel formation by homologous C5b-8 as well as C5b-9. J Physiol 2002;539:537–545. Landis DMD, Reese TS. Arrays of particles in freeze-fractured astrocytic membranes. J Cell Biol 1974;60:316–320. Pittock SJ, Lennon VA, de Seze J, et al. Neuromyelitis optica and non-organ-specific autoimmunity. Arch Neurol (in press). Rasband MN, Peles E, Trimmer JS, Levinson SR, Lux SE, Shrager P. Dependence of nodal sodium channel clustering on paranodal axoglial contact in the developing CNS. J Neurosci 1999;19:7516–7528. Bhat MA, Rios JC, Lu Y, et al. Axon-glia interactions and the domain organization of myelinated axons requires neurexin IV/Caspr/Paranodin. Neuron 2001;30:369–383. Debus E, Weber K, Osborn M. Monoclonal antibodies specific for glial fibrillary acidic (GFA) protein and for each of the neurofilament triplet polypeptides. Differentiation 1983;25:193–203. Walport MJ. Advances in immunology: complement (first of two parts). N Engl J Med 2001;344:1058–1066. Lennon VA, Lambert EH, Griesmann GE. Membrane array of acetylcholine receptors determines complement-dependent mononuclear phagocytosis in experimental myasthenia gravis. Fed Proc 1984;43:1764. Morgan BP, Gasque P. Expression of complement in the brain: role in health and disease. Immunol Today 1996;17:461–466. Bell DA, Komar R, Chodirker WB, Block J, Cairns E. A comparison of serologic reactivity among SLE patients with or without anti-Ro (SS-A) antibodies. J Rheumatol 1984;11:315–317. McDonald JW, Althomsons SP, Hyrc KL, Choi DW, Goldberg MP. Oligodendrocytes from forebrain are highly vulnerable to AMPA/kainate receptor-mediated excitotoxicity. Nat Med 1998;4:291–297. Zeng XN, Sun XL, Gao L, Fan Y, Ding JH, Hu G. Aquaporin-4 deficiency down-regulates glutamate uptake and GLT-1 expression in astrocytes. Mol Cell Neurosci 2007;34:34–39. Salter MG, Fern R. NMDA receptors are expressed in developing oligodendrocyte processes and mediate injury. Nature 2005;438:1167–1171. Smith T, Groom A, Zhu B, Turski L. Autoimmune encephalomyelitis ameliorated by AMPA antagonists. Nat Med 2000;61:62–66. Pitt D, Werner P, Raine CS. Glutamate excitotoxicity in a model of multiple sclerosis. Nat Med 2000;6:67–70.